Portable, prefabricated and modular buildings, namely office buildings, school buildings, retails buildings, health care buildings, correctional services buildings, commercial buildings and residential buildings. Estimating contracting work; negotiation and renegotiation of leases and subleases and the purchase and sale of buildings, including modular buildings; leasing or renting of buildings; lease-purchase financing; facilitating and arranging for the financing of modular buildings; general construction contracting; building construction and repair; custom construction and building renovation; construction supervision; construction planning; construction work site management; and leasing of metal and non-metal buildings for temporary use purposes. 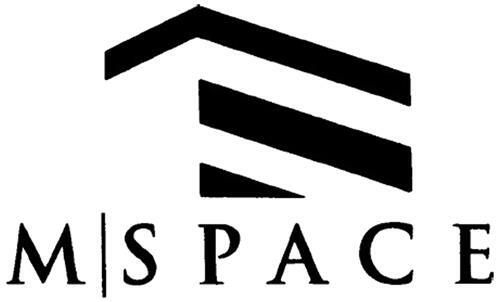 On Monday, December 8, 2008, a canadian trademark registration was filed for the above pictured logo by M SPACE HOLDINGS, LLC 10 Rockefeller Plaza, Suite 1416, New York, New York 10020, UNITED STATES . The Canadian IP office has given the trademark application number of 1420912. The current status of this trademark filing is Registration published. The correspondent listed for is BAKER & MCKENZIE LLP of BROOKFIELD PLACE, 181 BAY STREET, SUITE 2100, P.O. BOX 874, ONTARIO, CANADA M5J2T3 The trademark is filed in the description of Portable, prefabricated and modular buildings, namely office buildings, school buildings, retails buildings, health care buildings, correctional services buildings, commercial buildings and residential buildings. , Estimating contracting work; negotiation and renegotiation of leases and subleases and the purchase and sale of buildings, including modular buildings; leasing or renting of buildings; lease-purchase financing; facilitating and arranging for the financing of modular buildings; general construction contracting; building construction and repair; custom construction and building renovation; construction supervision; construction planning; construction work site management; and leasing of metal and non-metal buildings for temporary use purposes. .
(1) - Portable, prefabricated and modular buildings, namely office buildings, school buildings, retails buildings, health care buildings, correctional services buildings, commercial buildings and residential buildings. (2) - Estimating contracting work; negotiation and renegotiation of leases and subleases and the purchase and sale of buildings, including modular buildings; leasing or renting of buildings; lease-purchase financing; facilitating and arranging for the financing of modular buildings; general construction contracting; building construction and repair; custom construction and building renovation; construction supervision; construction planning; construction work site management; and leasing of metal and non-metal buildings for temporary use purposes.